The glass Christmas tree ornament in its incredible variety of shapes is certainly one of the most popular and famous types of Christmas decorations. Although it was not just produced in the German town of Lauscha, Lauscha is considered to be the centre of glass Christmas tree decorations. Lauscha in Thuringia and the villages in the immediate vicinity are the birthplace of glass baubles. Glass blowing has been practised there since 1597 and larger glass beads were already being produced there around 1770. Nuts and fruits made from colourful painted glass appeared for the first time on a toy sample card of Johann Simon Lindner in 1831/35, which probably already hung on Christmas trees as a permanent replacement for natural Christmas tree decorations. In 1848, “6 dozen Christmas baubles” in three different sizes can be found in the Hüttenmeister Gundelach order book for the first time and baubles in red, blue, silver and gold have been documented since 1860, as well as the so-called “Schacken”, a local name given to a certain style of bauble. The gasworks was founded in Lauscha in 1867, which enabled the development of more efficient glass blowing technology and therefore the mass production of glass Christmas tree baubles. In 1878 Christmas tree decorations were listed for the first time as a separate category by the Sonneberg Chamber of Trade and Commerce and called an upcoming sector of production. The first Christmas tree decoration catalogues were published with their latest ranges at the start of the 20th century. 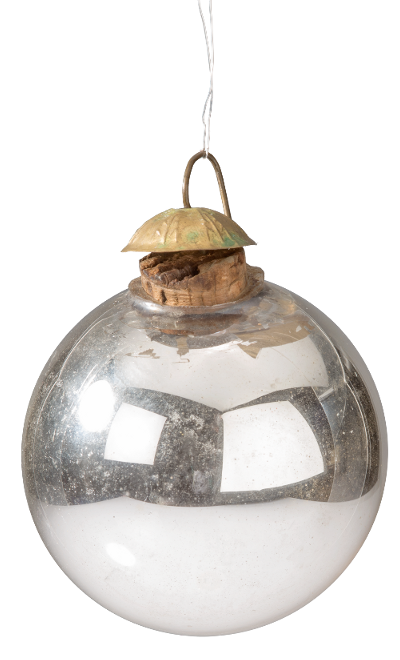 The first hand-blown Christmas tree baubles were made from thick glass, which received a lining with a silver-white pigment or lead and was therefore reflective. The still very large openings were closed with the help of corks which a ribbon was pulled through or decorated metal or brass caps. These early baubles are still very heavy. It was only from 1867 that thinner and therefore lighter baubles could be blown due to hotter and controllable flames. It was roughly from this time onwards that the less harmful silver nitrate was used for reflection. In Thuringia a very high percentage of glass Christmas tree baubles were also produced in cottage industries near the glassworks. The cottage industries ensured survival in many families until well into the 20th century. With the improved opportunities for production not only did productivity increase but so did the variety of different appearances. As a result the baubles could be blown in a plaster or porcelain mould to give it a specific shape. Another design could be achieved by using a plaster stamp, with which a so-called reflex could be pressed into the blown and reheated bauble. The classic Christmas tree tops are also produced by hand from glass or blown into a shape and reveal their own development trends over the decades but are indispensable on the classic Christmas tree. The different decoration techniques also allowed for more and more new bauble ranges: painted with gelatine or aniline dyes on the outside, sprinkled with “Venetian dew”, glass dust or glitter or wound around with wire web, the baubles appeared in constantly new designs in the Christmas range. Fairy hair, also called angel hair, is another glass product from Lauscha, which once decorated bourgeoisie Christmas trees. It is a highly shiny very thinly pulled glass fibre that is supposed to represent the Christmas angel’s curls. You can also find it on glass Santa Clauses, glass birds and as clouds under large angels on the Christmas tree top. 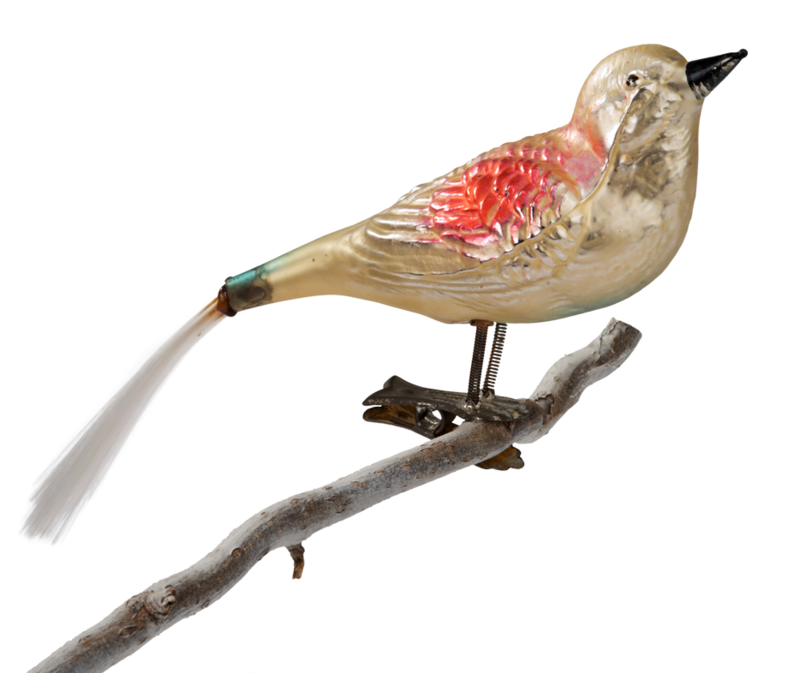 More and more new glass Christmas tree decoration varieties developed following the trend of general fashions over various years: for example more glass animals appeared in the Lauscha range at the start of the 20th century, in particular birds with glass silk tails. Complemented by a large variety of consumables and luxury objects as Christmas tree decorations, such as cars, vases, instruments etc. Art Nouveau influenced Christmas in that this period’s Christmas trees shone in silver and white decorations. The First World War initially interrupted the production of Christmas tree decorations in Thuringia but at the same time created the demand for new motifs. In the 1920s artistic glass and objets d’art became popular, made from single coloured glass or so called murrina, glass incorporating threads of different coloured glass. The National Socialist era during the 1930’s and 1940’s influenced the production of Christmas tree decorations with special Yule bauble editions. One special form of the glass Christmas tree decoration is the glass bead ornament from Gablonz (Jablonec) in Bohemia. Hollow lampworked beads have been produced there since the second half of the 19th century and are predominantly attached to clothing, bags or hair nets as decoration. 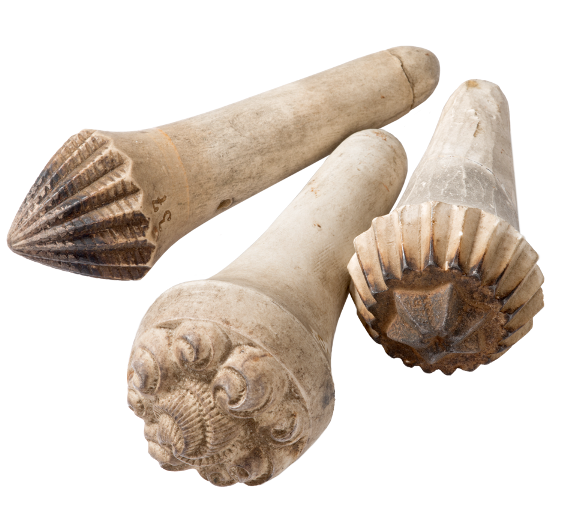 There were “free hand beads” or “moulded beads” blown in a model, as well as connected rows (up to 12 cm long) of blown beads, so-called “Klautschen” and the hollow blown 2-4 cm long glass pins and rings. The first Christmas tree decoration from Gablonz is supposed to be the result of the leftover individual beads being threaded onto a wire. Its production had its heyday around the turn of the century, although it always remained just an additional branch of the main sector of bead production. Bicycles, cars, ships, aeroplanes, insects, stars and musical instruments are preferred motifs for the varied Christmas assortment.